LCNAU is a network that brings together individuals, language programs, university structures and tertiary institutions. It aims to strengthen the tertiary languages sector in Australia through advocacy, collaboration, research and support. Find out more about the principles underpinning our work. Confirmed keynote speakers: Charles Forsdick (Liverpool), Joseph Lo Bianco (Melbourne), Jakelin Troy (Sydney). Ciao, Kon’nichiwa, Salut, Yaama. Who taught you that language? Why not nominate them for the Patji-Dawes award? 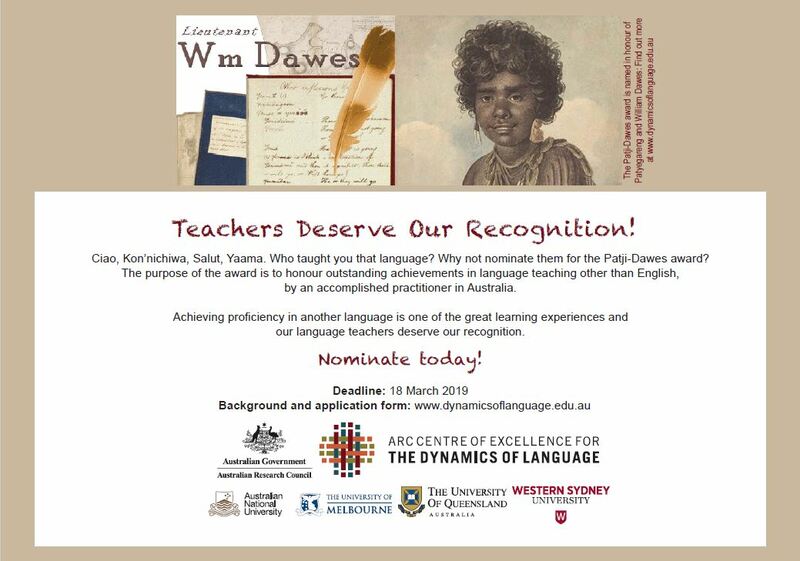 The purpose of the award is to honour outstanding achievements in language teaching other than English, by an accomplished practitioner in Australia. Achieving proficiency in another language is one of the great learning experiences and our language teachers deserve our recognition. The Australian Federation of Modern Language Teachers Associations (AFMLTA Inc.) is the national professional body representing teachers of all languages in Australia. LCNAU is pleased to be supporting University Languages Portal Australia (ULPA). To find out more about this exciting development for the languages sector, have a look at this short animated video! 2018-2019 Financial Year Membership – join or renew now! Memberships for the 2018-2019 financial year are now open! Join or renew your membership! Posted in LCNAU activities	| Comments Off on 2018-2019 Financial Year Membership – join or renew now! Publication processes for the peer-reviewed volume of essays resulting from the 2017 colloquium are well advanced and continue to respect the schedule for publication in 2019.